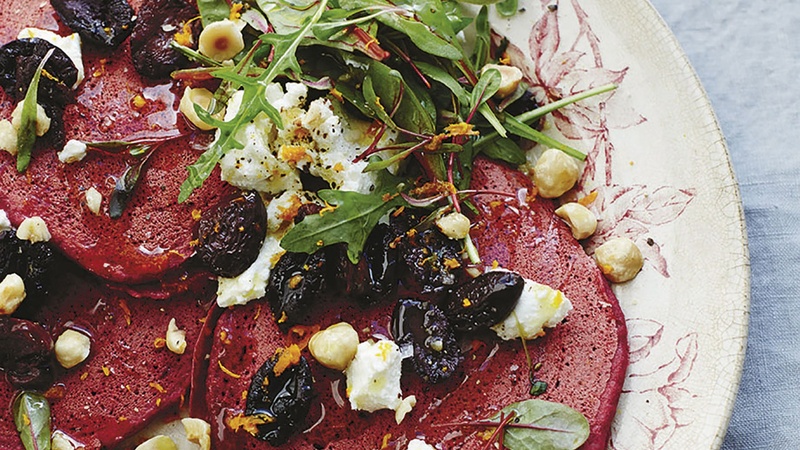 "The buckwheat and beetroot make these pancakes more satisfying and hearty than a normal one," says vegetarian chef Anna Jones. "If you can’t get buckwheat flour, spelt or wholemeal will do in its place. This is a brilliantly vibrant dinner of reds, greens, oranges and golden browns, and it looks so pretty on the plate. You can make the pancakes with carrots instead, in which case they are best topped with almonds and lime zest." Put the buckwheat flour and baking powder into a bowl and whisk in first 250ml of the milk and then the egg (if you are using chia seeds, add those instead of the egg, along with 3 tablespoons of cold water). Add a pinch of salt and grate in the beetroot using a fine grater. Leave the batter to sit while you get on with a few other things. It will thicken while it sits. You’re after a thick, American pancake batter consistency. You can add a little more milk if you need to. Heat a pan on a high heat, add the hazelnuts and toast until golden brown. Put to one side. De-stone the olives. Put the pan back on the heat, add a teaspoon of coconut oil, then the olives. Fry until they are beginning to crisp, then take them out of the pan and put aside for later. Now back to the pancakes. Put the pan back on the heat and add a little more coconut oil. Once hot, add 2 tablespoons of the batter to make little Scotch- sized pancakes, fitting as many into the pan as you can. Cook for 2–3 minutes, until bubbles appear on the top and they are starting to crisp up around the sides, then flip and cook on the other side for 1–2 minutes. Keep warm while you make the rest. If you are in a hurry you can have two pans on the go. Once the pancakes are all cooked, pile them on to four plates and top them with a little goat’s curd or cheese, the toasted hazelnuts, a shock of greens, the crisped olives and a grating of orange zest.